The old tree has died; in 1968 this fine old tree believed to be over 300 years old, fell victim to the Dutch Elm disease. No longer do its drooping branches provide shade as it did even for Indians when on their hunting forays, or for settlers who rested beneath it. 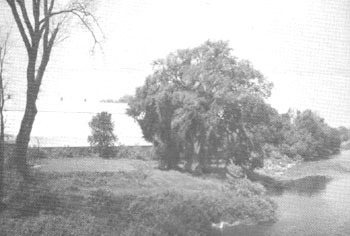 Simon Orchard, Paisley’s first settler, tied his raft to this tree in 1851 and built a home not far away. The giant tree was a meeting place; it was a notice board for new settlers to post notices or seek assistance probably for a barn raising; or articles for sale or lost were advertised; the coming of an itinerant clergyman was made known; a man advertised for a wife. The advent of the newspaper in 1865 reduced the importance of the old tree. Great cakes of ice in the spring floods gouged out part of its trunk, but it survived wind and flood to fall victim to an unseen force. Mail has been delivered rurally for 96 years f at first it was taken to small post offices from the central one in Paisley, by red covered wagons or cutters with the post office emblem, and the words Rural Mail written on the side. In 1913 mail was delivered from door to door in rural areas. Rural mail routes in this area were the second established in Canada. Sometimes mail carriers were expected to carry more than mail. When routes were first established it took most of a day to cover the route, but now a short run after noon, delivers mail over the same distance. Mail couriers have a deep sense of duty toward their job, doing their best, and making s\1.re the mail goes through, rain or shine. Neither snow nor rain nor sleet deter an intrepid mother and son mail team (Mrs. McArthur and ]ake). During the bad St. Patrick’s Day storm in 1973, to the amazement of the boxholders on their route, they defied the elements and as usual the mail was delivered. One of the main changes noticed by the courier is that so many farms are changing names. One heavy winter one of them recalls following the plow up the townline almost all the way, as he felt it was safer behind it. Always couriers find the people willing and ready to help in case of trouble. The adventures of a rural mail driver. Submitted by Wm. Minto f rural mail courierfor 39 years. The real adventures of the mail route were in the winters when the roads were heavy with drifted snow or spring floods covered them and a man sometimes had to depend on the sagacity of his horses. On one occasion, during the spring break-up of 1940, the courier was using a team hitched to. a buggy and was travelling north in Greenock township. 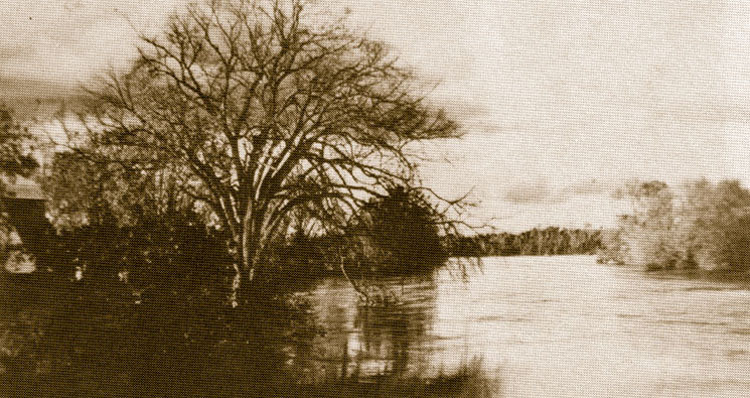 A dense fog made visibility poor as he neared a stretch of road which flooded each spring. A passer-by assured him the road was open but he approached with caution, his flashlight showing nothing ahead of the horses. Just a little further north he realized the road was under water, but hoped it was only shallow. There was a moment of indecision but the desire to get through with the mail overcame caution and driver and team pushed on. Guided by instinct, the horses kept to the roadway. It was well they did for on one side was an old creek bed where the water was running deep and could have drowned both man and team. The water over the road reached the height where it rose through the floor of the buggy and over the driver‘s rubber boots. Retreat was then impossible. Finally the water began to recede from the buggy and man and team reached the safety of the bridge. The first post office, established in Paisley February 1, 1865, was a small frame building beside where the hotel now is. The first Postmaster was Thomas Orchard. The mail at that time was delivered three times a week on a route between Elora and Southampton. The first mail carrier was John Lyons. Sometime during the 1860’s the mail began to be delivered daily. Postmasters over the years were, Mr. Saunders, from 1859-82, Mrs. Saunders 1883 until her death in 1917. Jim Laidlaw who was a son-in-law of Mrs. Saunders was acting postmaster at times, and then W.R. Barnett was appointed on May 31, 1917. His son Herb Barnett, who had helped in the Post Office since 1922, was appointed postmaster on October 1, 1931. 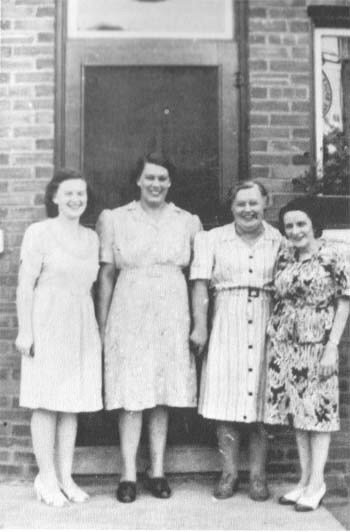 Mrs. Ethel Rock was acting postmaster from 1942-45 when Herb had military leave. Herb Barnett was postmaster until 1962. After the advent of the train, mail was brought by train each day, and carried by bus from the station. 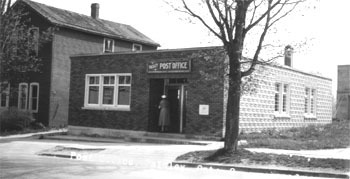 Later a courier brought mail and when the new Post Office was opened in 1954 mail was delivered by truck. There were originally 60 boxes with 6 drawers underneath for mail in the old post office with wicket service 8:00 A.M. to 6:00 P.M. six days a week. In the new building, which is modern in design, and built where the monument works was, the number of boxes is now 300 with 100 General Delivery. The present postmaster is John Worthington, who was appointed in 1962. The town’s first switchboard was installed in 1892 in a jewellery store owned by Frank Shepperd. It had only three telephones to service. The late Duncan McArthur bought the Bell Canada switchboard and operated it in his bookstore for a few years. The increasing number of phones prompted him to install a larger switchboard on Queen Street South. Then in 1912 the Bruce Municipal Telephone System started a second Switchboard in the present Stoddart and Sawyer furniture store. The late Robert Fullerton was operator in charge at a salary of $500.00 a year and was to hire his own help. The phones were crank type with a switchboard. The cost to have a phone was $9.00 a year to subscribers with land as a security, and renters paid $12.00 a year. In 1914 the operation moved to the Fullerton home, (now owned by John Murdoch, and then in 1923 the Municipal System purchased the Bell equipment and operated both boards from the Fullerton home for the next 27 years. The system bought the Stevenson Book Store on Queen Street in 1939 and built a red brick office on the lot. Mary Park was the chief operator. 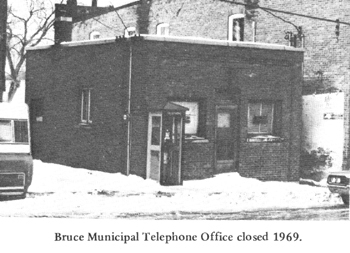 Then on November 2, 1969 the Bruce System changed over to the present dial system and a new building was built back of the former telephone exchange. The only unfortunate factor of the conversion of the exchange to dial service is the displacement of the efficient, courteous and helpful staff of the operators. 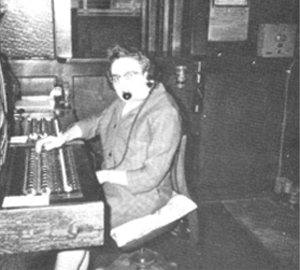 At the time of the changeover to the dial system, Mrs. Lester Leeson was Chief operator with 33 years service and was trained by the late Mr. Fullerton. 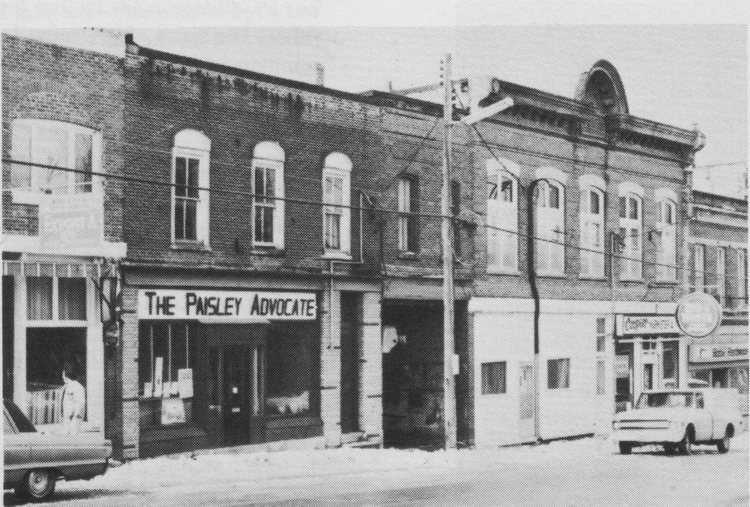 With the sale effective today, November 1, 1973 William “Bill” Matheson of Chesley becomes the twelfth publisher of the Paisley Advocate in its 108-year existence. The change in ownership brings to an end the 81 years in which this weekly newspaper has been published under the McKenzie family name. On February 17, 1865, Richard Goldie with his cases of type and hand press, printed the first issue of The Advocate. Through the intervening years, the humble weekly has recorded the story of daily events which go to make up the history of the village and district. The Advocate, which was founded nine years before Paisley was incorporated tells a story of a growing, thriving municipality in the first quarter century of its existence, and its eventual decline as industries, located too far from a ready market, failed one by one, and its citizens left for greener fields, in the cities to the south or the newly opened west. In its early years, The Advocate seems to have had a perilous existence, for it had no fewer than seven owners between 1865 and 1885. On February 20, 1890, the then publisher, Ainsley Megraw, issued a 25th anniversary number - the pink edition - which provides the early history of the paper. But even in those days, The Advocate wasn’t able to please everybody, and attempts were made to kill it, according to Mr. Megraw, who adds: “But from its start up at housekeeping it was a lusty housewife and refused to be snuffed out". Mr. Goldie was followed as publisher in 1869 by james Bishop, who continued to operate the paper until August 1872. In Mr. Bishop’s time, says Mr. Megraw, “the principal mission for the paper was to discuss railway matters, and to it no doubt was assigned the momentous task of keeping a watchful eye that Paisley’s interests were not lost sight of in the many plans now under consideration for the making or breaking of the ambitious young town”. Mr. Bishop was connected with Paisley’s first brass band, and associated with him in the organization were, among others, William Mather, the leader, S. Shannon, ].C. Gibson, Thomas Thompson, William McMorran, and others. Mr. Bishop was followed as publisher by John A. Murdoch in 1872. That was a red letter year - the year that the “iron horse” made its first trip to Paisley, for on the 8th ofjune that year - a very rainy day - the track was completed into the Paisley yard and the first engine made its way over the unballasted ties and rails, to be seen for the first time by the large majority of the vast assemblage brought together to witness the sight. Mr. Murdoch sold The Advocate in 1876 and went to Pilot Mound, Manitoba, where he continued in the weekly newspaper business. His son, Walpole‘Murdoch, for years after leaving Paisley, continued to write The Advocate of reminiscences of his days here. Mr. Murdoch sold out to Edward Saunders, who in turn in about a week found a purchaser in M.A. Clark. When the latter took over, the country was suffering from a trade depression and the fortunes of The Advocate declined. But at the beginning of 1880, John Collie, a young man from the office of The Huron Expositor, bought out Mr. Clark and with him from the same office came a fellow printer, Mr. Jas. R. Atcheson. They restored the public’s confidence in the paper. Early in 1881, Mr. Collie took a position with the Dumfries Reformer at Galt, and left Mr. Atcheson, in charge of The Advocate. Soon Mr Atcheson assumed the whole responsibility and had to grapple with the concern at a very difficult period. The Northwest boom struck the town very heavily, and a process of depopulation began. Mr. Atcheson however, continued to give the public a good paper until, April, 1885, he sold out to Ainsley Mcgraw. “We took hold of The Advocate with high hopes, and in Paisley we fancied we saw a great future in which tall chimneys were to play a prominent Part . . . Our hopes for Paisley ultimately taking her proper position are firm as ever and our confidence in her future unshaken.” So firmly confident was he that “on this auspicious occasion we have added a fresh lot of new type - a seal skin sacque in fact for the gold girl to put over the four year old dress and hide the frayed parts. To the plant also we added two years ago a new job press and for the book and pamphlet work we have established for the office a reputation, and this we find is what brings the trade. Our circulation has increased largely during the time, and when our businessmen begin to appreciate more the advantages to be derived from using our columns as we know they shall, the paper will be enlarged and printed from a larger and more improved machine. When our circulation and advertising enlarge to a sufficient extent to warrant such expenditure, it will undoubtedly be made”. Despite this optimism, two years later Ainsley Megraw sold The Advocate. At that time, his seven years of ownership had exceeded the term of any of his predecessors. When Dan McKenzie purchased the business and returned from Port Elgin to take over, he established the family connection which has continued for 81 years. He continued as publisher and editor until his death on November 4, 1949. Actually, Dan McKenzie’s association with The Advocate pre-dated his ownership. His initiation to the printing and newspaper trade came when, as a lad of 14, he started as a “printer’s devil” in The Advocate. 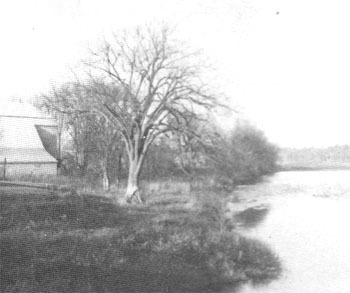 Then, after a few years in offices at Galt and Toronto, he returned to The Advocate for a brief period, before entering into a partnership in The Waterloo Chronicle with Robert Munroe, principal of the Paisley school. They soon sold out to take over The Port Elgin Times, where he remained for four years until returning to Paisley as owner of The Advocate. Following his death in 1949, a son, A. Ross McKenzie, now retired from The Woodstock Sentinel-Review and residing in that city, published and edited The Advocate until September, 1955, when C. Bruce McKenzie another son of Dan McKenzie, purchased the paper and returned here after 25 years with The Owen Sound Sun-Times. The telegraph service along the rail line was operated by the Montreal Telegraph Company until approximately 1882 when the Great Western Railway turned over their rights to the line to the Grand Trunk Railway. At the same time the Montreal Telegraph Company and another telegraph company operating mainly in eastern Canada (Dominion Telegraph Company) were merged into one company under the name Great North Western Telegraph Company of Canada. The new telegraph company provided telegraph service at all of the Grand Trunk Railway stations. In 1921 the Great North Western Telegraph Company of Canada was taken over by a newly formed company, Canadian National Telegraphs and the Grand Trunk Railway also was taken over by a newly formed company, Canadian National Railways. Telegrams and cablegrams were sent and received in morse code at the station at Paisley. The use of morse code was discontinued at Paisley in 1964 and thereafter telegrams were relayed by the Agent to the station at Walkerton over telephone lines. The Agent at Walkerton sent the telegram by teletype machine to CN Telegraphs in Toronto for onward handling. In 1968 Canadian National Telegraphs entered into an agreement with Canadian Pacific Telegraphs whereby only one company would offer telegraph service in a particular area, and since that time we have carried on business under the name CN-CP Telecommunications. 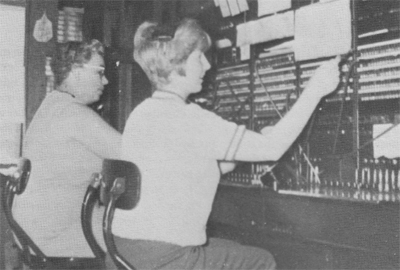 In 1971 a change in handling of telegrams at Paisley was made when a toll free Zenith telephone service was made available to patrons who wish to send telegrams. This telephone connection was with che CN-CP Telecommunications office at Kitchener where the telegram was sent to Toronto on a teletype machine for onward handling. The same year (1971) Canadian National Railways sold the Paisley station.Early in 1973 CN-CP Telecommunications at London Ontario took over the responsibility of providing telegraph service to Paisley and area via toll free In WATS telephone service on a 24-hour 7-day a week basis. Telegrams accepted at London office are sent to our computer at Toronto where the computer redirects the telegram to the proper destination. In the case of a cablegram destined to an overseas point, our computer directs the cablegram to a computer owned by Canadian Overseas Telecommunications Corpn., (CPTC) at Montreal where their computer redirects the cablegram to the proper country.